Therefore sodium hydroxide cannot be substituted for potassium hydroxide and vice versa because soap making recipes will have different quantity requirements for these two chemicals depending on the kind of soap being manufactured. In addition, the quantities required for soap saponification differ when using caustic soda and hydrated potash. Soap manufacturers do everything they can to hide the fact that they use lye in their soap. Dr. Bronners soap, which is considered “pure” natural, uses lye. It is hidden under the term “saponified oils”, which is actually the process of mixing lye with oil. Soap simply cannot be made without lye. Lye is commercially manufactured using a membrane cell chlor-alkali process. It is one of the highest volume industrial chemicals with an annual production of 40 million tons. It is supplied in various forms such as flakes, pellets, microbeads, coarse powder or a solution. I use flakes to make soap – but would use any form available. Food uses: Lye is used to cure types of food, such as: lutefisk; olives (making them less bitter); canned mandarin oranges; pretzels etc. It is also used as a tenderizer in the crust of baked Cantonese moon cakes, and in lye-water “zongzi” (glutenous rice dumplings wrapped in bamboo leaves); in chewy, southern Chinese noodles popular in Hong Kong and southern China; plus, in Japanese ramen noodles. Household uses: Lye is also valued for its cleaning effects. It is commonly the major constituent in commercial and industrial oven cleaners and clogged drain openers, due to its grease-dissolving abilities. Lye decomposes greases via alkaline ester hydrolysis, yielding water soluble, easily removed (e.g., rinsed away) residual substances. It does have hazardous reactions and has a potentially destructive effect on living tissues (e.g., skin, flesh, and the cornea). Solutions containing it can cause chemical burns, permanent injuries, scarring, and blindness—immediately upon contact. Lye may be harmful or even fatal if swallowed; ingestion can cause esophageal stricture. Moreover, solvation of dry solid lye is highly exothermic; the resulting heat may cause additional burns, or, ignite flammables. Therefore it is extremely important to use personal protective equipment including safety glasses, chemical-resistant gloves, and adequate ventilation when using lye to make soap (or clean your drain). The reaction between sodium hydroxide and a few metals is also hazardous. Aluminium reacts with lye to produce hydrogen gases. Since hydrogen is flammable, mixing a large quantity of lye (e.g., sodium hydroxide) and aluminum in a closed container is dangerous – especially when the system is at a high temperature, which speeds up the reaction. In addition to aluminum, lye may also react with magnesium; galvanized zinc; tin; chromium; brass; and, bronze—producing hydrogen gas. Therefore I always use plastic containers and glass when I make soap. It is estimated that 5.2 million people worldwide are now receiving treatment for AIDS (ARVs) that could save their lives. But more lives can be saved and the infection rate reduced if treatment start earlier according to the World Health Organisation WHO. Compared to the total number of HIV-infected. assumed to be at least 33 million, the 5.2 million is far from enough. But it is 12 times as many as in 2003, when WHO launched a special effort against HIV. In 2008 there were 4 million infected in ARV treatment. WHO now recommends that treatment is started even before the immune system is weakened and HIV develops into AIDS. ” An earlier treatment allows people to live healthier and longer with HIV,” said Dr. Gottfried Hirnschall, Head of WHO’s program on HIV / AIDS. According to WHO, it would be possible to reduce AIDS mortality by 20 percent between 2010 and 2015 if these guidelines for early intervention is implemented. Early treatment will also make it possible to prevent many infections, including tuberculosis (TB), which is the leading cause of deaths among people living with HIV and AIDS (PLWHA). According to WHO deaths from TB can be reduced by as much as 90 percent if people with both HIV and TB gets treatment earlier. ‘In addition to saving lives, the earlier treatment also helps in terms of prevention. The treatment reduces the level of virus in the organism, and this means that HIV-positive people are less likely to infect their partners with the virus. WHO guidelines will expand the number of people who should be on ARVs from 10 to 15 million. The AIDS epidemic was discovered in 1980/81. In the first 14 to 15 years there was no effective treatment and an AIDS diagnosis was basically equal to a death sentence. The big breakthrough in the fight against HIV and AIDS came with the introduction of combination therapies (ARVs) in the mid-1990s. Several different drugs used simultaneously were found to have a good effect. The change was so great that AIDS in large parts of the western world was transformed from a deadly disease to a life-long infection. But the HIV treatment is expensive and it requires both money and a relatively well-organized health system to establish and maintain lifelong treatments against HIV and AIDS. It is still my hope that one day ARVs will be available to everyone who needs it. As I work with research and business development for a Danish healthcare company, I travel quite a bit in the Asian countries – hereunder China. The article below from Financial Times describes to you how bad the pollution is in Beijing – and my advice to you – don’t go there if you can avoid it (not for living and not for holiday). Air pollution is driving expatriates out of Beijing and making it harder for companies to recruit international talent, according to anecdotal accounts from diplomats, senior executives and businesses. No official figures are available on how many people are planning to leave after three months of the worst air pollution on record in the Chinese capital. But companies that mainly serve foreign residents are bracing for an exodus around the middle of the year when the school term ends. Doctors at private hospitals that mostly treat expat patients tell a similar story. Pollution has long been a concern for residents in Beijing but air quality readings published by the city government and the US embassy indicated levels of toxic smog on some days in January that were nearly 40 times higher than considered healthy by the World Health Organisation. Although pollution levels have not yet returned to those seen during January’s “airpocalypse”, daily readings often hit levels considered hazardous. Residents are advised to avoid going outdoors at all and to limit their activity even while inside. The air pollution index in Beijing published by the US embassy gave a reading on Sunday afternoon between “very unhealthy” and “hazardous”. Most environmental experts and Beijing residents assume that the problem will only worsen as the government continues to encourage enormous expansion in industry, coal-fired power generation and car sales across the country. 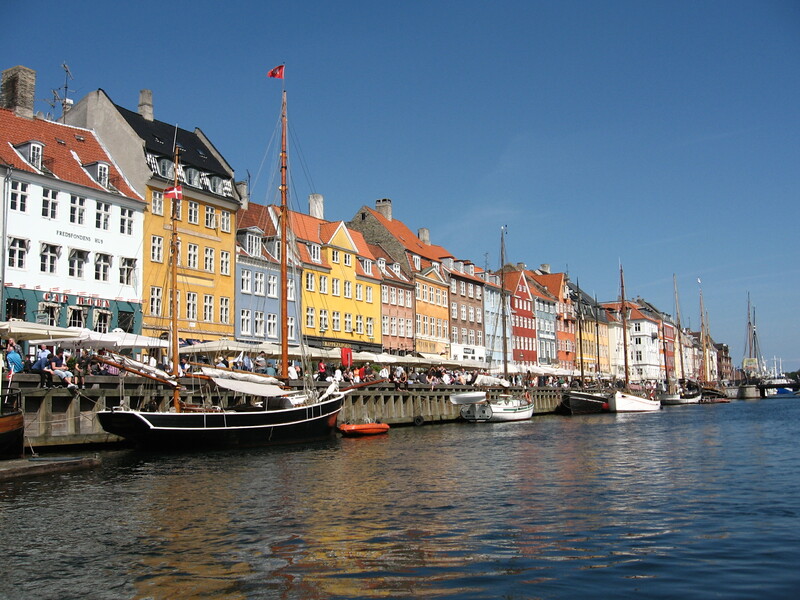 Lars Rasmussen, a Nokia marketing executive, and his wife Michelle Frazier, a kindergarten teacher, have decided to return with their two children to their native Denmark after three years in Beijing. The couple say one of the most important deciding factors was the air pollution. “Our kids can’t play outside or they have to wear face masks when they go out. It’s like something out of a science fiction novel,” Ms Frazier said. Of the roughly 600,000 registered foreign residents in all of China, about 200,000 live in Beijing, which has a total population of approximately 20m. But the expat community is overwhelmingly concentrated in high-earning professional jobs and contributes enormously to the city’s economy and the development of advanced industries. Christian Murck, president of the American Chamber of Commerce in China, told reporters on Friday that the unprecedented levels of pollution in January had been a “tipping point” for some families. He knew of “many people” who are planning to leave as a result. Executives at major companies and diplomats say recruiting new people to move to Beijing is one of the biggest concerns for businesses with China operations and many prospective candidates are declining positions because of air pollution, especially if they have young children. Michael Namatinia, the regional president of an Israeli software company, said filling a senior management role in Beijing has been extremely difficult. “We tried to recruit someone to run our North Asia operations from Beijing but after finding a suitable candidate and negotiating for a month the person’s wife vetoed the move because of air pollution,” Mr Namatinia said. However, no emergency warning was sent out and people continued their outdoor activity as if everything was okay. It’s going to cost live – millions of them in the future. It seems to be the way history repeats itself in China. No government does anything before millions of people die. So far “only” 8000 people died last year from pollution. Needless to say – lung cancer is the biggest killer in China, but the government likes to blame it on lifestyle choices such as smoking. “Nice” tactic if you can pin sickness on people themselves rather than failed energy, commercial and pollution policies! 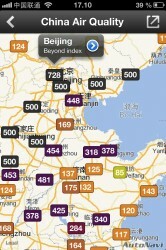 The pollution in Beijing (and China) is always very high and the last week it has been above 320 (pm2.5) every day. For those of you who have never been to such polluted places, let me explain how it makes you feel (the immediate effects): You start coughing uncontrollably, your lungs hurt for every breath you breath in, your throat gets sore (you develop a throat infection), you get a headache (due to lack of oxygen), you feel dizzy, you can’t concentrate and feel overall ill. That’s the immediate effects of a day like today. The long-term effects are much worse: lung cancer, throat cancer, bronchitis, birth defects to unborn children just to mention a few. PM affects more people than any other pollutant. The major components of PM are sulfate, nitrates, ammonia, sodium chloride, carbon, mineral dust and water. It consists of a complex mixture of solid and liquid particles of organic and inorganic substances suspended in the air. The particles are identified according to their aerodynamic diameter, as either PM10 (particles with an aerodynamic diameter smaller than 10 µm) or PM2.5 (aerodynamic diameter smaller than 2.5 µm). The latter are more dangerous since, when inhaled, they may reach the peripheral regions of the bronchioles, and interfere with gas exchange inside the lungs. The health effects caused by air pollution PM may include difficulty in breathing, wheezing, coughing and aggravation of existing respiratory and cardiac conditions. These effects can result in increased medication use, increased doctor or emergency room visits, more hospital admissions and premature death. The human health effects of poor air quality are far reaching, but principally affect the body’s respiratory system and the cardiovascular system. Individual reactions to air pollutants depend on the type of pollutant a person is exposed to, the degree of exposure. Chronic exposure to particles contributes to the risk of developing cardiovascular and respiratory diseases, as well as of lung cancer. • “Good” AQI is 0 – 50. Air quality is considered satisfactory, and air pollution poses little or no risk. • “Moderate” AQI is 51 – 100. Air quality is acceptable; however, for some pollutants there may be a moderate health concern for a very small number of people. For example, people who are unusually sensitive to ozone may experience respiratory symptoms. • “Unhealthy for Sensitive Groups” AQI is 101 – 150. Although general public is not likely to be affected at this AQI range, people with lung disease, older adults and children are at a greater risk from exposure to ozone, whereas persons with heart and lung disease, older adults and children are at greater risk from the presence of particles in the air. 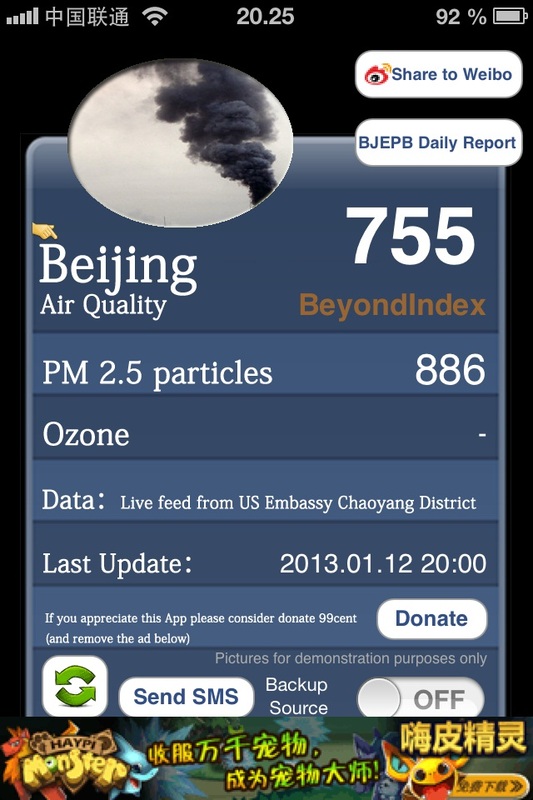 • “Unhealthy” AQI is 151 – 200. Everyone may begin to experience some adverse health effects, and members of the sensitive groups may experience more serious effects. 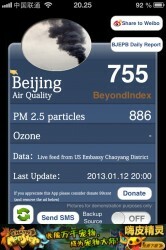 • “Very Unhealthy” AQI is 201 – 300. This would trigger a health alert signifying that everyone may experience more serious health effects. 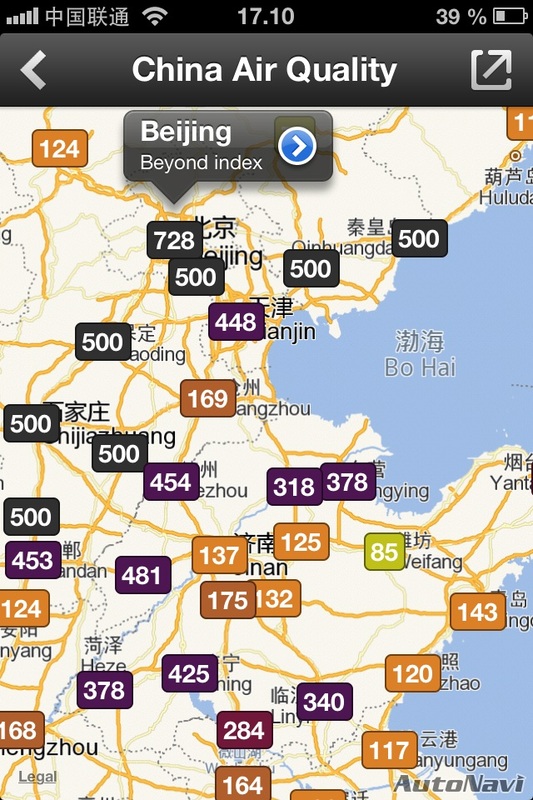 • “Hazardous” AQI greater than 300. This would trigger a health warnings of emergency conditions. The entire population is more likely to be affected. Am I worried about the health of the Chinese people – yes, I am. And I am worried about the health of the world’s population…air pollution knows NO borders. You should be worried too!! !